The Big Five in Two Drives! A South African game reserve is not a zoo! All the many different species roam and interact freely and it is sometimes a real challenge to find what one is looking for, as there is plenty space on Thanda’s 15,000ha for the animals to “hide”. But with a little bit of luck, some superb tracking work and good communications between the game drive vehicles it is possible to beat the odds. 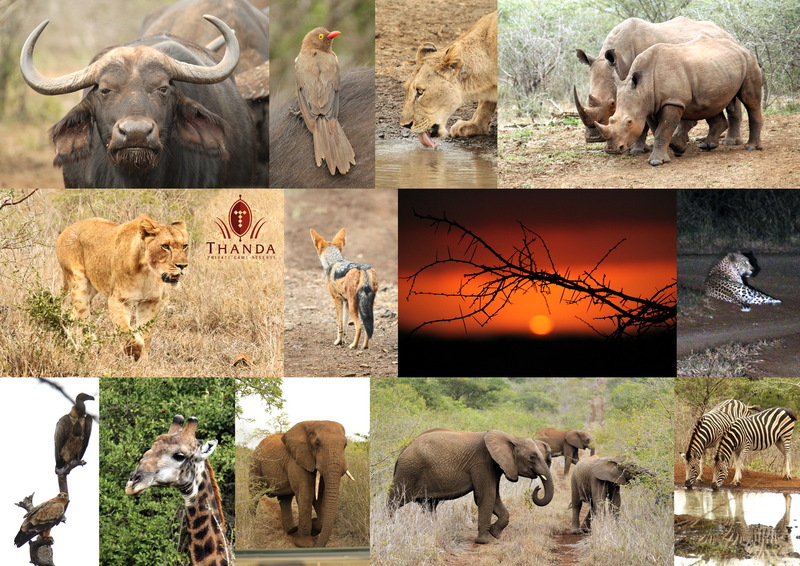 The pictures in this collage were taken on only two game drives. The Thanda guests enjoyed great sightings of a herd of Cape Buffalo with Red-billed Oxpeckers, a Lioness drinking at a waterhole, White Rhinos getting upset about the Lioness, a Black-backed Jackal following the Lion hoping for some left-overs, a beautiful sunset, a shy Leopard after dusk, a Tawny Eagle and White-backed Vultures around a carcass, an old Giraffe gentlemen ruminating, a naughty young Elephant bull challenging us, a breeding herd of Elephants crossing the road and some Burchell’s Zebras having a drink at a waterhole. We also spotted three Black Rhino, but they decided to leave before we had a chance to take pictures. And we even had time for an evening drink stop with Thanda Martinis as well as morning break enjoying hot chocolates with Amarula!